CONVERSABLE ECONOMIST: Manufacturing Up, Pollution Down: How? From 1990 to 2008, US manufacturing output (measured in inflation-adjusted dollars) rose by about one-third. At the same time, emissions of six common air pollutants fell by about 60%. How did we pull this off? Joseph S. Shapiro and Reed Walker tackle this question in "Why is Pollution from U.S. Manufacturing Declining? The Roles of Trade, Regulation, Productivity, and Preferences," which was published in January 2015 as a working paper for the Center for Economic Studies at the US Census Bureau. Here's a figure showing the basic question. Real US manufacturing output is the solid blue line, where the 1990 level is set equal to 100, and changes are shown relative to that level. The air pollutants shown are carbon monoxide (CO), nitrogen oxides (NOx), particulate matter (PM2.5 and PM10 refer to particulate matter that is either less than 2.5 microns or less than 10 microns), sulfur dioxide (SO2), and volatile organic compounds (VOCs). Research suggests at least four possible explanations of these substantial improvements in U.S. air quality. First, U.S. manufacturing trade has grown substantially. When dirty industries like steel or cement move abroad, total U.S. pollution emissions may fall. Second, federal and state agencies require firms to install increasingly stringent pollution abatement technologies. Some research, for example, directly attributes national changes in air quality to the Clean Air Act and to other environmental regulations. Third, ... Americans may gradually choose to spend less on heavy manufactured goods and more on services and cleaner goods. Finally, if manufacturers use fewer dirty inputs each year to produce the same outputs, then annual productivity growth could improve air quality. The authors use plant-level data that includes the value of shipments, production costs, and pollutants emitted. They lay out a detailed industry-level model of firms and the choices they make about reducing pollution, and then use that estimate the model with data. As is standard for any exercise like this, the model is a useful (and indeed, an unavoidable) way of organizing the data and suggesting connections, and the detailed results will depend to some extent on the specific model chosen. They also do some specific analysis of the extent to which emissions of specific pollutants changed when tighter rules were put into effect. Readers with the technical skills can dig through the paper and evaluate it for themselves. Here, I'll stick to some big-picture insights. 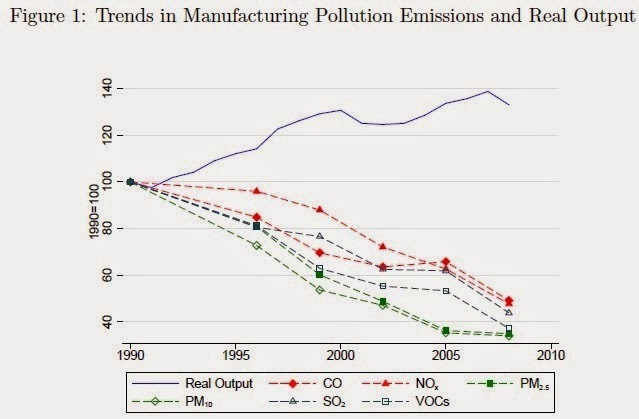 The decline in pollution from US manufacturing doesn't seem to be due to a change in what was produced: instead, it's mostly a case of lower pollution to produce specific products. They write: "[C]hanges in the scale of manufacturing output or changes to the composition of products produced cannot explain trends in pollution emissions from U.S. manufacturing between 1990 and 2008. Instead, changes in emissions over this time period were almost exclusively driven by decreased pollution per unit output for narrowly de fined products." This insight suggests that while it is certainly true that global supply chains are shifting parts of manufacturing around the world, and that American consumers are spending money on services, these factors are not causing the fall in pollution from US manufacturing production. Instead, Shapiro and Walker find strong evidence that environmental regulations are what made most of the difference. "[W]e fi nd that the increasing stringency of environmental regulation explains 75 percent or more of the 1990-to-2008 decrease in pollution emissions from U.S. manufacturing. ... [W]e find that changes in U.S. productivity have had small e ffects on U.S. pollution emissions at the economy-wide level." hardly changed over this time period." Of course, this sort of study doesn't analyze costs and benefits: that is, it doesn't show either that the costs of these new pollution rules were worthwhile, nor does it analyze whether some alternative form of regulation might been able to achieve the same reduction in pollution at lower cost. However, the fact that it is possible to substantially reduce air pollution while still having manufacturing output rise has broader implications for holding down pollution in the US and around the world. Readers might also be interested in earlier posts on "Costs of Air Pollution in the United States" (November 7, 2011), "Air Pollution: World Biggest Health Hazard" (April 1, 2014), and "Other Air Pollutants: Soot and Methane" (June 28, 2012).